Not much to say about this at the moment. It's an uMAX to DIP converter for an upcoming project. uMAX is a miniature surface-mount package used by Maxim, that resembles Mini SO (MSOP) . The below adapter is uMAX10 -> DIP14 (there is no DIP10, so I used 14), for comparison a DIP8 and a SO8 chip are on the picture. The uMAX pin spacing was really pushing the boundaries of PnP Blue. 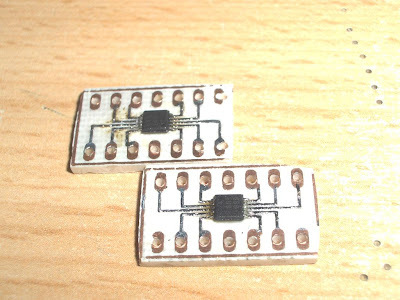 The chosen chips soldered in. I wouldn't mind using these chips as-is on surface-mount boards, but I don't like working with hybrid boards, and most of the necessary components for the particular design I intend to use these in were available in through-hole packages for me, so I chose to make these adapters instead of making a hybrid board. Hi I was wondering how you soldered the umax 8 to your breakout board. Any tricks? Thanks. Using lots of flux and dragging a blob of solder over the pins. Solder-wick any excess or shorts, re-flux, re-heat check under magnifying glass, repeat until good then clean :) I also usually tin the pads with a used piece of solder-wick before starting. Good luck! Huh.. I'm guessing you didn't succeed in removing some of the solder bridges? Solder wick, xacto knife and magnifying glass would be my choice of tools for solving that. 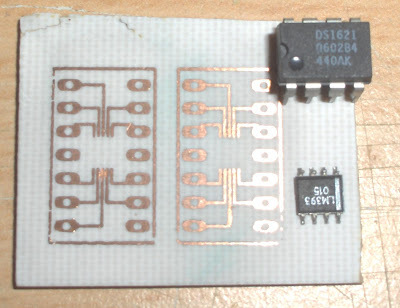 Also I'd try to use less solder for the initial soldering of the chip.